Healthy Stuff's mission is to research toxic chemicals found in everyday products. A new report by Ecology Center (EC), Global Alliance for Incinerator Alternatives (GAIA), and Changing Markets Foundation (CM) reveals the presence of toxic substances in all 12 of the carpets tested that were produced and sold by the nation’s six largest carpet manufacturers: Engineered Flooring (J+J), Interface, Milliken, Mohawk, Shaw and Tandus Centiva (Tarkett). Toxic chemicals detected have been linked to cancer, hormone disruption, respiratory disease, heart attacks, strokes, asthma, and immune and developmental health problems in children. The landmark study is the first of its kind to test the nation’s leading carpet brands for specific toxic chemicals. The report also outlines proven strategies to better protect human health and the environment by designing healthier carpet, increasing product transparency, and enabling safer carpet recycling. 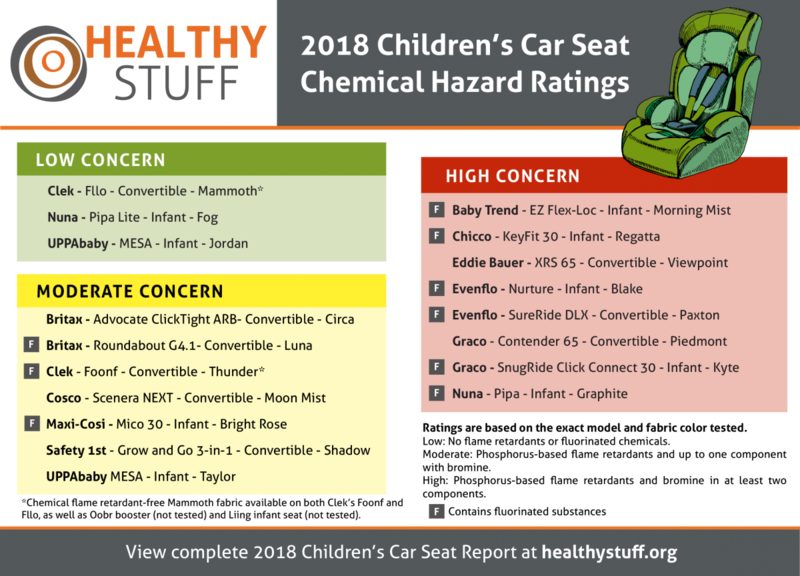 On December 3, 2018 the Ecology Center released test results and product ratings in their 2018 report, Hidden Hazards: Flame Retardants & PFAS in Children's Car Seats. Testing and rating child car seats periodically since 2006, the Ecology Center has been tracking changes in hazardous chemical additives of popular car seat brands. Additionally, the authors of this report collaborated with researchers from Indiana University to publish detailed analytical results in the peer-reviewed journal, Environmental Science & Technology Letters, including the first-ever report in the scientific literature of the presence of a new flame retardant chemical in products in North America. Important note: Child car seats are mandatory safety devices that save lives. Regardless of any chemical concerns, parents should always properly install and use a children’s car seat. Did you know store receipts are a major contributor to your body’s intake of the hormone-disrupting chemicals BPS and BPA? These chemicals are quickly and efficiently absorbed into the bloodstream through your skin. To understand current use of these chemicals in receipt paper, Ecology Center’s Healthy Stuff program tested 207 paper receipts from a wide variety of businesses. The samples included major grocers, big-box stores and retailers like Meijer, Kroger, and TJX stores, as well as gas stations, theaters, libraries, small and independent businesses, and many more. Laboratory testing, commissioned by the Ecology Center, of 10 varieties of macaroni and cheese products has revealed phthalates, a toxic hormone-disrupting class of chemicals, in the cheese powders of all the boxed macaroni and cheese tested. We are calling on The Kraft Heinz Company—the dominant seller of boxed macaroni and cheese, with 76 percent of market share—to drive industry-wide change by eliminating any sources of phthalates that may end up in its cheese products. Detailed information and a public petition are available at KleanUpKraft.org. In a citizen science study conducted by the Ecology Center's Healthy Stuff project, pet owners in Southeast Michigan sent 60 dog and cat food cans for identification of the resin linings. Pet food cans overall had a higher frequency of both BPA-based and PVC-base coatings than human food cans. It is high time that manufacturers remove toxic flame retardant additives from their product lines. It is simply unacceptable to continue using toxic chemicals to make products meant to provide safety to our most vulnerable population, our children. It's true; car seats save lives. But, safety shouldn't come with a hidden chemical cost. That is why we are challenging car seat manufacturers to produce a car seat without adding flame retardants. UPPAbaby recently proved this can be done through their Mesa Henry infant seat, the first ever car seat manufactured without added flame retardants that still meet fire safety standards. We need both consumers and advocates to put the pressure on other manufacturers to follow UPPAbaby’s lead. We want toxic-free car seats! Sign the petition. In this study, we analyzed flame retardants and other chemicals in fifteen infant and toddler car seats purchased in 2016, including two from the United Kingdom. The brands are BabyTrend, Britax, Chicco, Clek, Cosco, Diono, Evenflo, Graco (two models), Joie, Maxi-Cosi, Nuna, Orbit, Recaro, and Safety 1st. The seats represent a broad price range and about half were brands also tested by our team in 2014. One company has answered our longtime call. Uppababy unveiled a new car seat for 2017 specially designed to contain no added FRs. 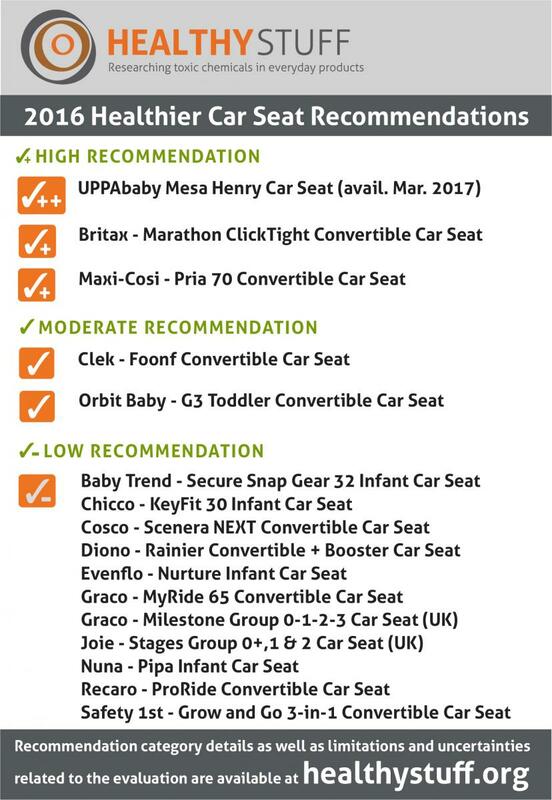 To our knowledge, the MESA Henry will be the first flame retardant-free car seat on the market, and its story and test results are included as a sidebar in this report. Mardi Gras Bead Study, 2013: The report contains data on our 2013 Mardi Gras bead study. Guide to New Vehicles 2011/2012: This report contains our most recent set of vehicle screening as well as historical test results for nearly 1,000 vehicles. The objective of Testing Carpet for Toxics: Chemicals affecting human health and hindering the circular economy was to provide a snapshot of the toxic substances present in carpets sold by some of the largest carpet manufacturers in the US compared to carpets sold in the European Union (EU). On December 3, 2018 the Ecology Center released test results and product ratings in their 2018 report, Hidden Hazards: Flame Retardants & PFAS in Children's Car Seats. Testing and rating child car seats periodically since 2006, the Ecology Center has been tracking changes in hazardous chemical additives of popular car seat brands.